DUBLIN, Oct. 3, 2018 /PRNewswire/ -- Allergan plc (NYSE: AGN) announced today the launch of a new JUVÉDERM® advertising campaign created to empower the next generation of consumers to "JUVÉDERM® IT." JUVÉDERM® IT marks the first new advertising campaign in three years for the world's #1 selling dermal filler collection1 and was designed to further Allergan's goal of making the JUVÉDERM® Collection of Fillers a first choice and household name for consumers. "Healthcare providers already know that JUVÉDERM® is the #1 selling collection of dermal fillers,1 but consumers tend to think about 'fillers' as a general category. This bold, high-impact, new campaign will empower women to own their look and ask for JUVÉDERM® by name," says Carrie Strom, Senior Vice President, US Medical Aesthetics for Allergan. "The campaign is on television and in print, but it really comes alive online and on social media. 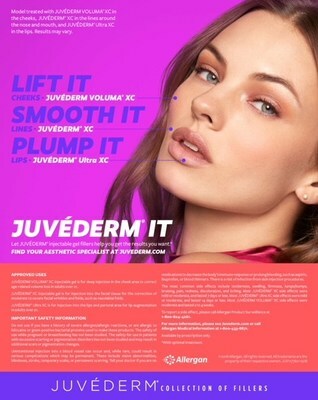 We are already seeing healthcare providers posting about the campaign and encouraging their patients to JUVÉDERM® IT!" The JUVÉDERM® Collection of Fillers offers a complete range of dermal fillers specifically designed for different patient needs, rather than taking a 'one size fits all' approach.2-6 The JUVÉDERM® IT campaign will re-energize the brand with a modernized logo and bright, poppy color scheme. The refreshed talent, imagery and edgy soundtrack will also grab the attention of millennials, Generation X and Baby Boomers and inspire them to curate their own looks with JUVÉDERM®. "At Allergan, our goal is to educate and empower consumers to do what is right for them when it comes to aesthetic treatments," says Strom. "It's all about personal choices. Whether they want a subtle or dramatic look, whether they seek treatment now or five years from now, we're here to offer a range of solutions to help every patient achieve their aesthetic goals." DDB New York developed the creative vision of the campaign, which was shot by Giovanni Messner of Brother Production Company. Print and broadcast media will run for the remainder of 2018 and into 2019 and will replace all existing creative. 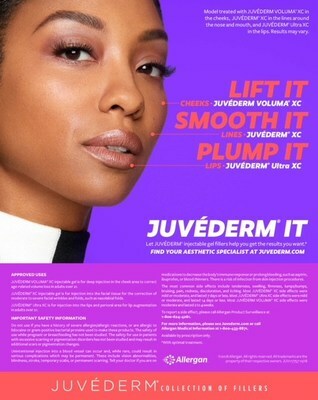 Visit www.juvederm.com to learn more about the JUVÉDERM® Collection of Fillers or to find a doctor. 1. Data on File Allergan, Inc.; Proforma Sales JUVÉDERM VOLUMA® XC, 2015. 2. JUVÉDERM® ULTRA XC Patient Labeling, 2016. 3. JUVÉDERM® ULTRA PLUS XC Patient Labeling, 2016. 4. JUVÉDERM VOLUMA® XC Patient Labeling, 2016. 5. JUVÉDERM VOLBELLA® XC Patient Labeling, 2016. 6. JUVÉDERM VOLLURE™ XC Patient Labeling, 2017.